Hostilities between the European powers had been in the wind as early as 1911 when the German Kaiser sent one of his battle ships rattling around the French colonial port of Agadir, in a direct challenge to a Triple Entente signed by France, Britain and Russia who had teamed up against Germany and Austria. In June 1914, the heir apparent to the throne of the Austro-Hungarian Empire was murdered in Sarajevo. Austria sought to find the assassins on sovereign Serbian territory giving the Germans the excuse they needed to go to war. Germany stepped in on Serbia’s side, and on Aug. 2, 1914, declared war on Russia. Two days later, Britain declared war on Germany. Because the British foreign office was responsible for Canadian foreign policy, Canada, was automatically at war. Canada’s Minister of the Militia, Col. Sam Hughes, promised to raise an army of 20,000 volunteers. A man of explosive temperament, Hughes began the mobilization by frantically building a new military training base at Valcartier, Quebec. The hastily assembled 14th Battalion was pulled together from three existing Montreal militia regiments: The 1st Regiment Canadian Grenadier Guards, the 3rd Regiment Victoria Rifles and the 65th Regiment Carabiniers de Montreal, and styled itself the RMR. Canada in 1914 was dismally unprepared for a European war, but then again, it didn’t need to be. Going to war had real appeal. Everyone assumed it was going to be a short and easy fight. More than a third of them, like Charles D.B. Whitby a 27-year old Gazette reporter were British immigrants to Canada who were eager to defend their motherland. Whitby was originally from Bath and hoped to chronicle the battalion’s war exploits for the paper. The Montreal Star sent the head of its promotional department, Hugh Graham Brewer. Thomas Moore, who had served with the Welsh fusiliers in China during the Boxer Rebellion and had earned the distinguished conduct medal was from Merseyside. Frank “Scrimmy” Scrimger was a slight, 130 pound doctor with the Montreal Heavy Brigade of the Canadian Garrison Artillery. He had picked up some German while studying medicine in Dresden and thought it his patriotic duty to enlist. Fred Bagnall, a student from Prince Edward Island, had just arrived in Montreal to work at the YMCA. He signed up even before he wrote home to tell his disapproving Quaker parents what he had done. There were recent arrivals to Canada too, like 25 year old Gerrit Brouwer, a young Dutch labourer who feared for the safety of his family back in Holland, and there were mercenaries in the crowd as well. As the men left the parade ground, deep thunder rolled overhead and flashes of menacing lighting foreshadowed what lay ahead.. The sons of millionaires, like 21-year old Andrew Paton Holt, whose father was President of the Royal Bank marched alongside the sons of blue-collar workers like Leo Bélanger, a 23 year old French-speaking tailor from east-end Montreal, who enlisted out of a sense adventure and Fortunat Auger, a young architectural draftsman, who thought he might further his education in Europe. 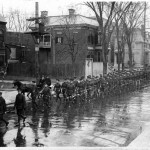 One of the battalion’s four companies of about 250 men would be designated French-Canadian, although English was to be the regiment’s official language, thus, in theory at least, starting a tradition of official bilingualism years before it was officially ingrained. Hughes decided the regiments would be numbered, not named. Cheekily, the men of the 14th began referring to themselves as “The Westmount Regiment”. 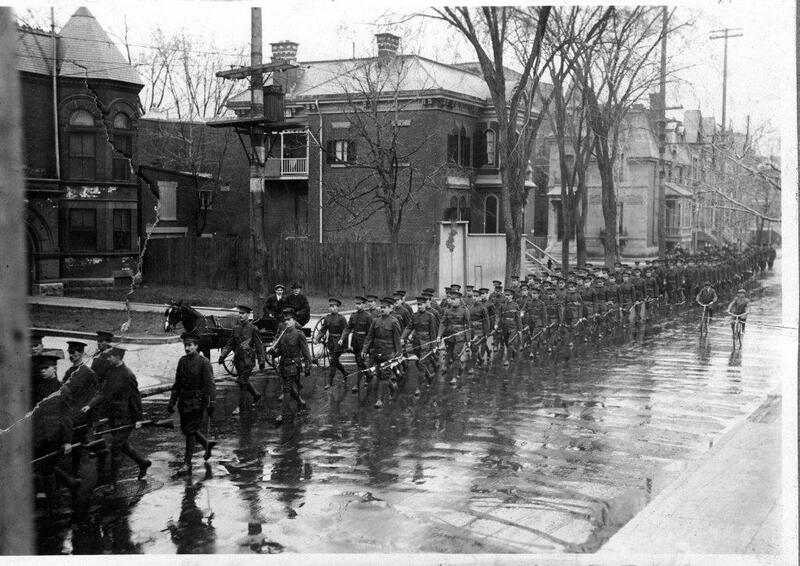 By the time they arrived for basic training at Valcartier it had become “The Royal Montreal Regiment.” Under the command of their opera- loving Lieutenant-Colonel, Frank Meighen, 46 officers and 1,097 men of the 14th set sail for England on Oct. 30, 1914 aboard the new Cunard liners Alaunia and Andania. They were thrilled to have received their marching orders, less thrilled when they arrived for military training at Salisbury Plain, a desolate chalk plateau near Stonehenge, 150 km south west of London. It would be one of the wettest and coldest winters in British history. The Regiment spent a miserable autumn and winter in the cold and the mud. “The camp looks exactly like a gold rush, and feels like Yukon most of the time,” one soldier wrote to his parents. Conditions were so brutal, three soldiers with the 14th died meningitis. The Regiment was duly recognized by the British as a fighting force on Nov. 2. Its first fight, it discovered, was, however, to preserve its Canadian identity. Lt.-Col Meighen asked Sgt. Herbert Salmon, a draughtsman who had spent 14 years in the Canadian Permanent Force, to design The Regiment’s cap badge. Meighen disingenuously assured Salmon that the 14th was indeed designated “Royal” and therefore entitled to a badge with the garter, motto and the crown. Salmon produced a rudimentary sketch and wanted something more detailed. But Meighen pronounced the design “satisfactory.” The high command had not yet approved of the so-called “Royal” designation or the cap badge. It wanted to strip the expeditionary force of any Canadian insignia, make them all British soldiers. On November 4, 1914 King George V arrived to inspect the new born Regiment with the rest of the Canadian Division, and found the soldiers soaked to the skin and shivering in their boots. The constant coughing prompted one of their commanding officers to order them to, “Shut up or his Majesty will think you are a company of consumptives.” By Christmas conditions on Salisbury Plain were so miserable that “training was impossible and recreation difficult to arrange.” It wasn’t until February that the 3rdth Brigade under the command of Canadian Brigadier General Richard Turner and with Ross rifles – guns that easily jammed in rapid fire conditions and were not very dependable – was deployed to Fletre, near the Belgian Frontier. Turner, a Quebec City native, had been awarded the Victoria Cross during the Boer War. No one questioned his bravery, but as a commander, he himself admitted he had “a lot to learn.” Under Turner, in charge of 14th Batallion, was Lt-Col. Frank .Stephen Meighen. At an inspection ceremony in Fletre, the British Field Marshall John Denton Pinkstone French, whose best years on the battlefield were behind him, was impressed enough to remark that if the men were as tough as they looked, the Germans were in trouble. Their initial objective was to relieve embattled colonial French troops along the Western Front, a meandering network of trenches that stretched for 700 km from Ostend, Belgium to Basel, Switzerland. The strategy was to be “stationary, yet aggressive” and keep the 51st German Reserve Division from advancing from occupied Belgium into France.